We Drink Your Milkshake! : Has Benedict Cumberbatch's Villain Identity Been Revealed? Has Benedict Cumberbatch's Villain Identity Been Revealed? 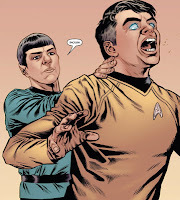 STAR TREK was a definite surprise when it came out a couple years ago. I think expectations were that it would be good, but no one could have really predicted how fun and actually great it ended up being. Now we're still a little less than a year away from the sequel, and this film is filled with even more speculation than the first one. Whoops! So if Urban is correct, then Mitchell is an acquaintance of Kirk from the original TV series. Mitchell ends up getting telepathic and telekinetic god-like powers, and in the end, he ends up battling Kirk in a showdown, like you do. So, did Urban actually let it slip a key bit of information about the sequel? Or is he just being a troll? Good thing we have until next May to speculate! 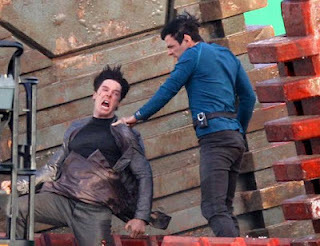 STAR TREK 2 will be released May 17, 2013 starring Chris Pine, Zachary Quinto, Zoe Saldana, Karl Urban, and Benedict Cumberbatch.